Ufology is a fascinating world where everyone is invited. There is so much to discover and understand. Few people know that UFOs are one of the most sought and promoted topics on the Web : blogs, resource site, groups, etc.. In all bestiary where the most wacky ideas flow, it can be difficult to find reliable information, or at least, first hand. Or, as ufology still does not exist as discipline académique, just not Anyone can submit ideas, left to defend calmly with arguments. It is true that some people perform investigations, but therigorous investigation in ufology is not common. This is why we would like to define here what GARPAN term "professionalism in ufology" to inform the public and our future employees about what we expect from them. This is accompanied by a researcher who had spent 35 years of his life to ufology we have learned to dedicate himself to this mysterious topic to penetrate the mysteries. We were able to educate us, during the 100 training hours, how ufology was a sophisticated discipline and compartmentalized, using many auxiliary sciences and strict protocols. That is why we believe it is better to work as a team in the field of ufology, because almost no one is able to gather all the specializations required to be a qualified investigator-. This is also the reason why the power GARPAN himself developed training 45 hours to instill the knowledge and skills to minimum wishing to join our "Group Support and Research". But ufology can really become a profession ? Exercising this profession ? 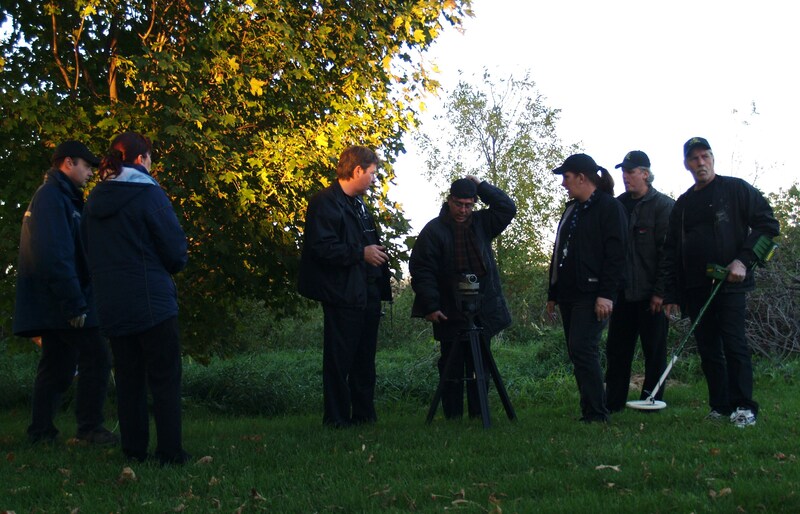 As UFO researcher Marc St-Germain will demonstrate in a book (forthcoming) the Project MAGNET, many UFO incidents have marked Canada's military history. Not only passively detecting UFOs, but also actively, participating with the Americans to build bases provided installation able to "shoot down UFOs" ... Therefore, if we are thinking well, it is obvious that some military officers, the subject of UFOs was prominent in their professional duties at some point in their careers. En second lieu, we can not say that ufologists experienced as FC. BOURBEAU or J.CASAULT - what we can blame them ! - Have not made their passion for UFOs occupation that borders the title of 'occupation' : decades, they were available to listen to the witnesses, colligeant information carefully each witness, for systematic reviews ; they developed the training to pass on their acquired, they compiled the sum of their work, they became at times references to the public, Finally the results of their investigations best (certainly !) taken over by the government agencies dealing with UFOs a "more professional" level ... They have made the majority of their research funding and without direct compensation, as pure volunteer, is not an argument against "ufology as a profession", but rather the sign of his election to a cause worthy of sacrifice and recognition. In my opinion, the work of the investigators-UFO is more a profession than an insurance salesman, a newscaster or a prison, etc..
One can also cite the example of author Jim MARSS has already given a formal course on UFOs at a university in California (UBerkeley say je me scrambling bien). 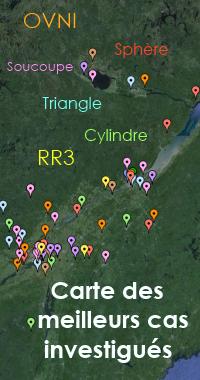 If that still eludes our knowledge : remember that Canadian sites ufology (serious) regularly traveled (every three weeks) by computers on the Canadian Intelligence Service. I can also mention the story of the webmaster and main collaborator of the UFO ALERT-Network, whose car had been tapped in 2010 ! 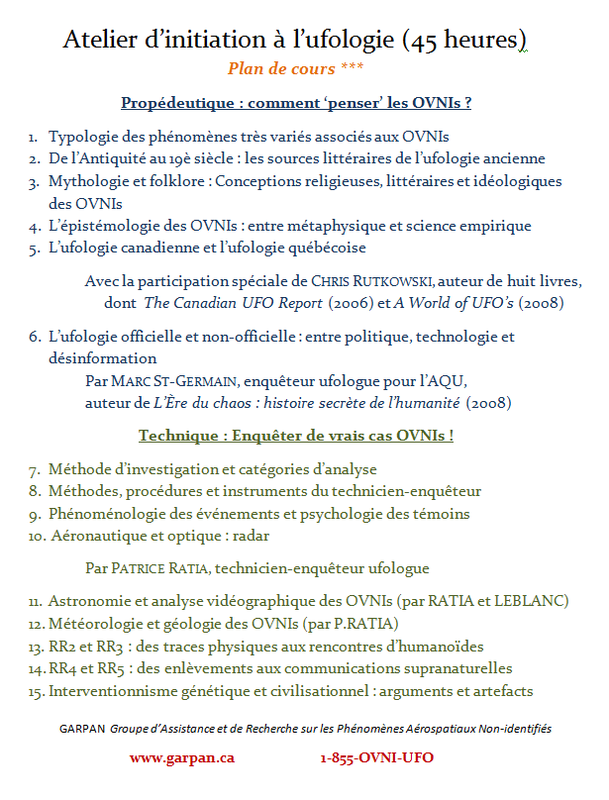 If only the civil ufology could receive more recognition, if only credible organizations bringing together leading experts from a country or a province could really work well, it is increasingly possible to consider investigating ufology as a profession, especially if it was governed as "professional courses" and if it became self-sufficient and therefore paid. Until recently, Marc St-Germain (host of new UFO meals Hautes Laurentides) auprès promoted to the Agency, du CEO, GARPAN and the UFO ALERT-network as a consolidation project for the good of our discipline, but without much success. Having even received a "total silence" from the presidency of the AQU, he resigned. 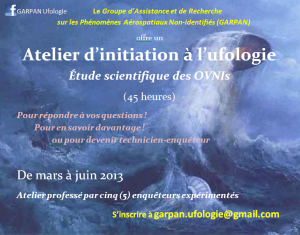 Our side, the GARPAN has always encouraged such a project and maintain our support for M. ST-GERMAIN its projects for the common good of civil ufology. – our listening and support we can offer. – Our ANNUAL REVIEW handed to them each year (click HERE to see our REVIEW 2012 including 56 notifications or case investigation). We belong to the same organization or not, it is most unfortunate that so many unnecessary conflicts splash public showcase of ufology : the first thing is respect between researchers, for unless we are FAITHFUL to the cause that unites us : and that is nothing less than the recognition of the reality of the UFO phenomena, one of the great scientific challenges still unresolved ... It is not nothing still ! To view a specific example of professionalism in ufology, read HERE the second part of the article. 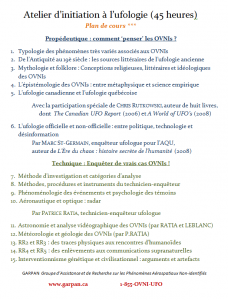 The investigation of the humanoid CHAUVEAU Park and "professionalism in ufology"
A Commission & rsquo; investigation of UFOs Quebec to deliver to the Government ? Next story The investigation of the humanoid CHAUVEAU Park and "professionalism in ufology"